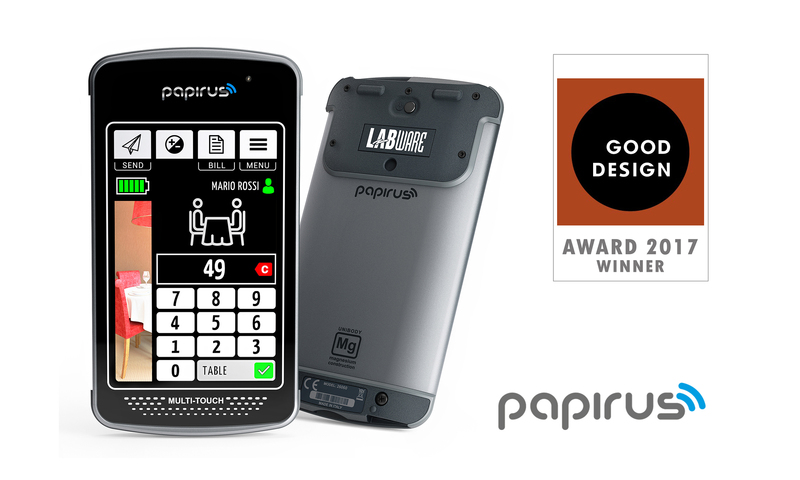 We are pleased to announce that Labware’s new handheld Papirus has won the Good Design™ Award 2017 in the Retail Fittings category. The awards program by the Chicago Athenaeum Museum of Architecture and Design is the oldest and one of the most recognized programs worldwide, celebrating excellence in design and engineering. For 2017, the Museum received submissions from several thousand of the world’s leading manufacturers and industrial and graphic design firms from over 55 countries. Our winning product, Papirus, is a highly innovative device which employs patent-pending technologies and represents an epic evolution for restaurant wireless ordering: with a super e-paper multitouch color display, automatically operating in dual-mode (in-/outdoor), it ensures optimal readability in any lighting conditions, even in direct sunlight. Papirus boasts many more unique features, which we invite you to discover on our website (see Papirus product page). Papirus is now part of the Permanent Design Collection of the Chicago Athenaeum Museum of Architecture and Design.